BODEN LYDIA LACE DRESS. 84% cotton 16% polyamide, lined in pink polyester/elastane satin, machine washable! red embroidery trim to front bodice and around waist. fitted shape, back zip. Boden Size 20L Cotton Dress Purple with embellishment. Free P&P. Beautiful cream/pale gold BODEN dress in a size UK10R(US 6R). Fabric has a gorgeous daisy design with a waistband in pale gold daisy design. In lovely condition it has only been worn once and has no damage. In a polyester/cotton mix with full polyester lining. It is fitted with a back zip. Armpit to armpit - 34” Waist - 30” Length - 38” This item will be carefully packaged and sent via Royal Mail’s 2nd class signed for post to ensure safe and tracked delivery. GORGEOUS SPECIAL OCCASION MIDI BODYCON DRESS FROM BODEN SIZE 18 L. MADE FROM STRETCH VISCOSE JERSEY IN DARK NAVY WITH RUCHED SIDE PANELS IN BLUE RED WHITE YELLOW AND PINK FLORAL PRINT. FULLY LINED IN NAVY JERSEY. Ladies Sleeveless Cotton/Elastane Blue Pencil Dress By BODEN Size 8. Fully lined in Cotton with a Boat neckline and a bib in the centre with a Design feature of 4 Lime Green circles edged with plain white buttons and white stitching. Empire Line and a 4.5” plain Lime Green hem. A Fabulous Dress in Excellent Condition. Bust 32”. Waist 30”. Hips 35”. Shoulder to hem 40”. Dispatched Worldwide with Royal Mail 2nd Class Signed. Dark blue fitted lace dress fully lined. 100% Cotton. BODEN LIMITED EDITION. This beautiful dress has a multi tulip print. Navy blue top with crossover style and covered in sequins. Top is 55% silk and cotton blend. Skirt is 100% silk. Size UK 10. A real head turner on. Dark grey with cream floral print. concealed zip to the side under the arm. you have a chance to buy this beautiful dress. 17" from underarm to underarm. 100% cotton. A gorgeous Boden dress in signature notch neck shift styling. Constructed in lovely slub cotton, elegant creamy vanilla colourway. BODEN NOTCH NECK SHIFT DRESS (WH361). Shoulder to hem: 39". machine washable at 40 degrees. BODEN EASY RICK RACK DRESS. rick rack trim in yellow, orange and pink to neckline, front bodice and frilled hem. fitted bodice, back zip. Pink Peonies. BODEN Notch Neck Shift Dress (WH249) £79. An elegant fitted shift dress by BODEN. As noted by many reviewers on the Boden website, the concealed side zip doesn't go all the way to the arm so it takes a bit of careful wriggling to get into and out of the dress. THIS IS A WONDERFUL BODEN PONTE BEADED DRESS SIZE 16 REG IT IS A BLUE COLOUR AND IT IS SLEEVLESS IT HAS A PRETTY BEADED DETAIL TO THE NECKLINE IT HAS A REAR CONCEALED ZIP THE BUST IS 38"--40" AND THE LENGTH IS 38" FROM THE SHOULDER. Boden Bow DRESS. Lovely bow bodice. Machine washable. Flattering fitted shape through bust and waist with a pencil skirt. Length finishes at knee. Heather Terrazzo. BODEN Notch Neck Shift Dress (WH249) £79. An elegant fitted shift dress by BODEN. As noted by many reviewers on the Boden website, the concealed side zip doesn't go all the way to the arm so it takes a bit of careful wriggling to get into and out of the dress. BEAUTIFUL TAILORED DRESS, FROM BODEN LIMITED EDITION RANGE. EXCELLENT CONDITION, NEW-- RRP £250. DARK GREY AND GOLD BROCADE, BEAD DECO AROUND NECK LINE. ACROSS WAIST AREA 17". ARMPIT TO ARMPIT 20.5". Boden Ladies GORGEOUS Vanda Broderie Dress Size UK size 8R RRP £130 Brand new. 100% cotton Cafe au lait /brown and white. In lovely condition. BODEN LADIES Fabulous cotton belted dress. Brand new. 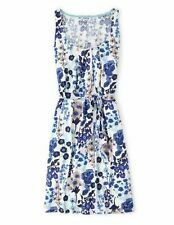 BODEN LADIES Fabulous cotton dress with belt. Peach with black ivory purple grey flower design. Length 44”. Pleated below waist centre. Boden Shift Dress. Length 42". Good Pre-Owned Condition. Gorgeous lace shift dress, made from pure cotton. Labelled as a UK 14R. Beautiful dress in good condition. Some light bobbling/pulling. See all pictures. Size 10. Thanks for looking. Style WH095 from Boden. Stunning large polka dot cotton dress with a full flare skirt. Lovely 50s rockabilly style, especially if worn with a petticoat. Perfect for a wedding, cruise or special occasion. Boned bodice dress. prom style dress. 100% cotton. white red large check. Good condition. BODEN LADIES GORGEOUS NAVY KNITTED ELEANA DRESS UK Size 8R WW222. BRAND NEW. 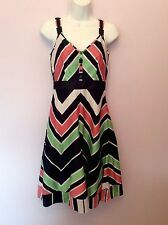 Boden Vanda Broderie Dress Size UK12L rrp £130.00. Finished with elegant broderie anglaise. Bring out your inner film star in this feminine dress. Length 44". Waist 28.5 - 30. BODEN FLOWERSHOW DRESS SIZE 6 LONG BNWOT IT IS A MULTI COLOUR WITH A CONCEALED SIDE ZIP, FULLY LINED, FULL SHAPE SKIRT BUST SIZE 30 LENGTH 40 ALL LABELS REMOVED. Turquoise Boden sheath dress, UK size 8, lightly used. Condition is Used. Dispatched with Royal Mail 1st Class. 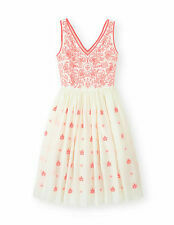 Boden Lydia Lace Dress. this dress certainly has a lot of ooh-la-la. Lining 94% polyester 6% elastane. Pair with court shoes for instant elegance. Machine washable. Outer 84% cotton 16% polyamide. The slightly flared skirt creates a flattering shape. BODEN Beaded Wiggle Dress. More Details: Pull on stretch dress, beaded neckline, hand wash. Colour: Taupe. Armpit to Armpit: 18.5" no stretch applied. Waist: 32" no stretch applied. Condition: Excellent Used Condition - Shows very few signs of previous wear. THIS IS A WONDERFUL BODEN PONTE BEADED DRESS SIZE 18 REG IT IS A BLUE COLOUR AND IT IS SLEEVLESS IT HAS A PRETTY BEADED DETAIL TO THE NECKLINE IT HAS A REAR CONCEALED ZIP THE BUST IS 40"--42" AND THE LENGTH IS 38" FROM THE SHOULDER.